(Reuters) - President Hosni Mubarak provoked rage on Egypt's streets on Thursday when he said he would hand over powers to his deputy but refused to step down after more than two weeks of protests demanding that he quit. The armed forces high command had earlier issued "Communique No.1," declaring it was taking control of the nation in what some called a military coup seeking to end the turmoil under the 82-year-old former general, who has ruled for 30 years. "Leave! Leave!" chanted hundreds of thousands who had gathered in Cairo's Tahrir Square in anticipation that a televised address would be the moment their demands were met. Instead, the former air force commander portrayed himself as a patriot and war hero overseeing an orderly transition until an election in September -- in which he said last week he would not stand. 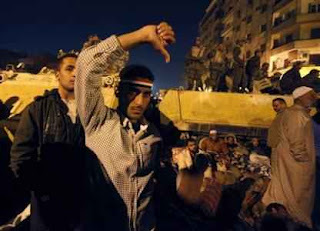 Mubarak praised young people who have stunned the Arab world with unprecedented rallies. He offered constitutional change and a bigger role for Vice President Omar Suleiman. Waving shoes in the air in a dramatic Arab show of contempt, the crowds in central Cairo chanted: "Down, down Hosni Mubarak." Asked if Mubarak would step down, an Egyptian official had told Reuters before the speech: "Most probably." But his information minister had said that would not be the case.